Over 1,350 runners at Bloomberg Square Mile Relay Singapore – Macquarie Wins | JustRunLah! Runners taking off from the start line at flag off. 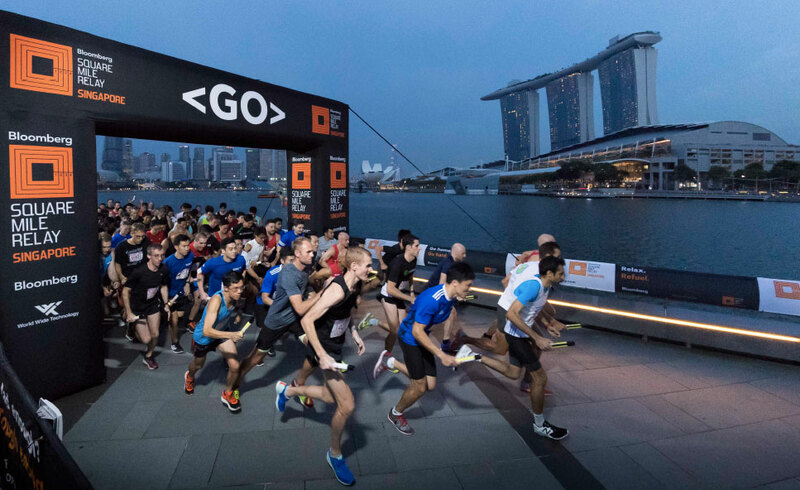 Over 1,350 participants from the city’s biggest corporations competed in the fifth edition of the Bloomberg Square Mile Relay in Singapore. The team from Macquarie took the title of ‘Fastest Firm in the City’, completing 10 laps of the one-mile (1.6 km) circuit in a time of 54 minutes and 58 seconds, followed closely by the team from Standard Chartered Bank and GIC in second and third respectively. In the highly popular Mixed Team category, the team from Bloomberg emerged victorious with a combined running time of 61 minutes and 39 seconds. Team Captain Baldwin Choy said “I am ecstatic about this victory, and it was completely unexpected. It feels good to run and know that I’m part of an event that is helping the community. Glad to be supporting Habitat for Humanity and can’t wait for next year! A S$10,000 cheque was presented to SportCares Foundation by Andrea Mosconi, Head of ASEAN, Bloomberg to support their CareRunners program. Each team’s participation in the race also helped fund the ‘Extra Mile’ program – a project in partnership with Habitat for Humanity Singapore. Runners will be able to volunteer with the local Square Mile Relay community on Saturday 25th November to improve the living conditions of vulnerable elderly citizens and revitalize shared living space for hundreds of residents through a home cleaning. The Bloomberg Square Mile Relay is part of an international series that spans 10 cities worldwide. For more information, visit www.squaremilerelay.com.